The affordable storage interface for any ZX Spectrum! Small and very easy to use! – Printed manual – read the manual here! 16K, 48K, 48K+, 128K, +2, +2A, +2B, +3 and some clones. The DivMMC EnJOY! is not compatible with the Spanish Investronica ZX Spectrum 128K. – Very fast: load games in seconds! – FAT and FAT32 compatible – easy file transfer! – Support for various emulator formats: .TAP, .SNA, .TRD and more! – New and easy BASIC commands and many fun and useful tools! – Create snapshots to continue a game later! – Write support to SD card with easy commands! – Updates are still being developed; installing an update is easy! Visit www.worldofspectrum.org to download lots of games and other software! 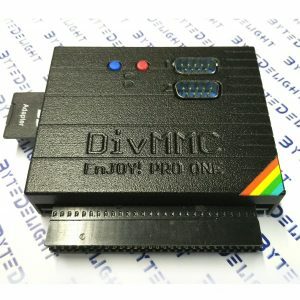 If you want a more complete solution, check out the webshop for the DivMMC EnJOY! with joystick interface! ← ZX-AY External Stereo audio interface for all ZX Spectrum models!